My name is Melissa Villa. 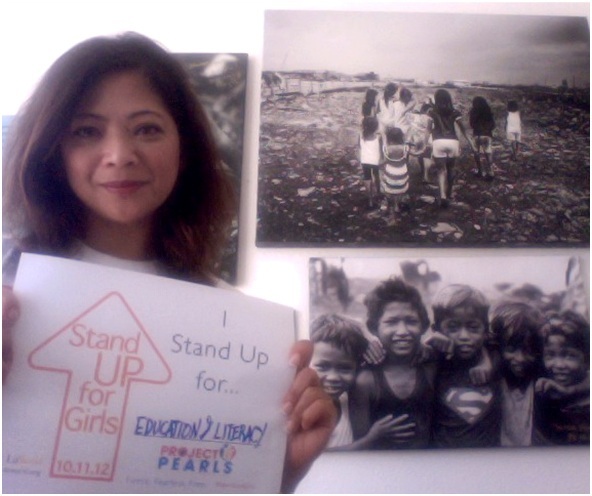 I Stand Up for EDUCATION and LITERACY. Growing up as a young orphan and an “ugly duckling,” I knew in my heart and spirit that getting an education would be my comfort, strength and beauty. I wasn’t a straight A student. I was more of your average student who tried enough not to fail in school. I succeeded, and I failed, but that didn’t stop me from trying harder each time. Education is not just about schooling, or the specific facts you gain inside a classroom. Education is more about learning. The knowledge and skills you learn in school prepare you to face the challenges that life brings you. Literacy, the ability to read and write, helps us in our daily decision-making, judgment and problem solving. Sadly and tragically, not everyone is fortunate and blessed to get an education. Not everyone is literate. This is why I Stand Up for Education and Literacy, especially for the poorest of the poor children in the Philippines. Being able to read and write is the most beautiful and important journey a child can ever have, even if, and especially if, that child is living in poverty. Thanks to the freeing power of education and literacy, I no longer feel like the “ugly duckling.” I can proudly say, I feel the happiest, and most blessed because of the way I am able to offer an education and literacy journey to hundreds of children living in poverty in Manila, Philippines, through the work of Project PEARLS. Melissa founded Project PEARLS in 2008, to help the poorest of the poor children in the Philippines have a better life through various outreach programs. PEARLS strives to give children Peace, Education, Aspiration, Respect, Love, and Smiles. In the summer of 2010, Melissa was introduced to the children of Ulingan by photo journalist Sidney Snoeck. Since then, Project PEARLS has focused their outreach efforts is in Ulingan, a slum and garbage dumpsite community where over 400 families contend all day with the heat, fumes, dust, stench, flies, mosquitoes and vermin. Project PEARLS, has a weekly Feeding Program, Scholarship Program and quarterly Medical Mission in Ulingan. To learn more visit http://www.projectpearls.org/.